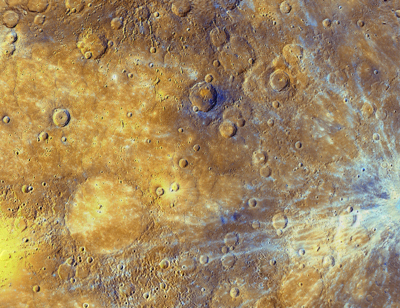 Mercury’s volcanic nature has been revealed by NASA’s MESSENGER mission. We now know that all, or most, of the surface has, at some point, been flooded by lavas, sometimes in extremely voluminous eruptions. The ages of Mercury’s lava surfaces reveal that large-volume effusive volcanism ceased about 3.5 billion years ago due to planetary cooling. Mercury’s crust then went into a state of global contraction, thereby impeding further magma ascent. However, some smaller-scale volcanism continued at zones of crustal weakness, particularly at impact craters. Much of this later volcanism has been violently explosive, with volatile gases potentially helping the magma rise and ripping it apart when released to the vacuum at the surface.